Data search and processing that is faster and more energy-efficient than conventional hard disk drives is what you get with the Intel Solid-State Drive (SSD) DC S3500 series. Ideal for read-intensive applications, such as cloud computing and web hosting, you will be most impressed with the many features of this SSD. Intel Corporation is an American multinational corporation and technology company, headquartered in Santa Clara, California. The Intel company was an early player in the field of creating SRAM memory chips and DRAM chips, and these two types of chip made up the bulk of Intel's business until the year 1981. While Intel was the first company to produce a commercial microprocessor, and this was in the year 1971, it was really the success of the personal computer that emerged as the core of Intel's business. Then, in the 1990s, the Intel company pushed into the creation of microprocessor designs that helped the personal computer industry grow even faster. All of this research and internal knowledge of computers led to the development of the Intel Solid-State Drive (SSD) DC S3500 with all of its excellent features. This Intel Solid-State Drive, or SSD model, from the DC S3500 Series is a data center computer component that gives fast and reliable read performance while protecting your data. This SSD has 20 nanometer flash technology and an updated controller. This SSD delivers data at a rapid pace with consistently low latencies and tight IOPS distribution. This chip delivers great performance for applications like fast, lag-free video streaming and video conferencing. This chip delivers 75,000 IOPS and 4K random read, and it does all this on less than 1.3 watts of power, so it helps to cut your energy costs. Protecting your data center applications is stress-free with multiple security checkpoints providing protection against data loss and corruption. The Intel Solid-State Drive (SSD) DC S3500 offers full, end-to-end data protection. The actual NAND used in this drive is a gate structure used to create a form of flash memory that can be electrically erased and reprogrammed. This SSD also reduces potential data loss by detecting and protecting data from an unexpected system power loss. 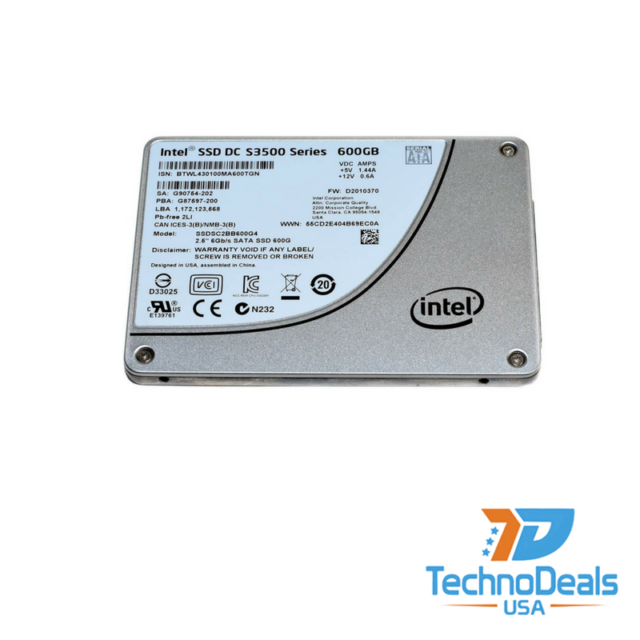 The Intel Solid-State Drive (SSD) DC S3500 is optimized for such high efficiency by increasing storage efficiency in your data center with the low power and high performance DC S3500 M.2 in a small form factor. This means you can optimize your dollars per IOPS, energy costs, and floor space in your data center with the amazingly efficient Intel SSD DC S3500 Series. With a combination of consistent read performance with strong data protection and leading edge 20 nanometer flash technology, you can’t go wrong with the Intel Solid-State Drive (SSD) DC S3500 series for your computing needs.